Are you tired of your misaligned front teeth? It’s never too late to get them straightened. In fact, more adults are choosing to undergo orthodontic treatment than ever before. Maybe it’s because options like Smart Moves make the process easier (and more subtle) than you had ever dreamed possible. Your cosmetic dentist in Bonita Springs is pleased to offer patients smile transformation with this clear braces treatment! You’ve heard of Invisalign clear braces, right? 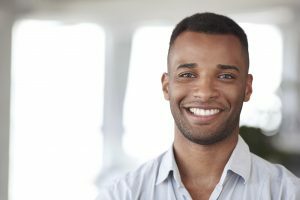 Smart Moves is very similar to this popular orthodontic option in that it uses clear plastic aligners to shift the alignment of crooked, crowded, or gapped teeth. The most significant difference is that Smart Moves focuses on straightening out the front teeth that show when you smile, rather than overhauling your entire bite. By focusing on improving aesthetics rather than occlusion (how your bite lines up), treatment times with Smart Moves are generally much shorter than with Invisalign. The average treatment time is just about one year with Smart Moves. Smart Moves is similar to Invisalign and other options in clear braces, but there are some key differences between the treatments. Knowing them can help you determine which option is best for you and your smile. Smart Moves is generally more affordable than other clear braces options, since treatment times are shorter. Invisalign uses a series of plastic trays, while Smart Moves works with 2-3 week “set ups” that use both hard and soft aligners. With Smart Moves, you wear the soft aligner first, then use the hard one to finalize the movement. Smart Moves is best for making quick movements to the front teeth that improve the aesthetic of the smile. Smart Moves cannot be used on the back teeth. How Do I Use Smart Moves? If Smart Moves is a good option for your smile, your dentist will talk you through your treatment so you know just what to expect at every stage. You can also call us at any time with questions or if something damages the integrity of one of your aligners. You should wear your aligners round the clock, except when you are eating, drinking, playing certain instruments, and during contact sports. Take Smart Moves out to brush and floss thoroughly at night and in the morning. Clean the aligners daily with a non-abrasive toothpaste. Never expose the trays to hot water, which could cause them to warp. Soaking the trays in a denture cleaner is a good idea for keeping it clean — but don’t leave it in mouthwashes containing alcohol or anything effervescent. If you are tired of your crooked front teeth, your dentist in Bonita Springs may be able to help with Smart Moves. Contact us to learn more about the treatment or schedule an appointment at Pelican Landing Dental today!